We’ve had a houseful of people since Christmas Eve and it’s not over yet. We’re expecting more guests up until the second weekend of January. I’m tired just thinking about it. But hey, that’s what the holidays are all about…or at least that’s what they tell me. I like to think it's all about the food...but let's keep that between us. I've been baking cookies since the beginning of December. Don’t think for a minute this means I wasn’t still preparing dessert on a weekly basis…because I was. Heck, I even whipped up a Ricotta Nutella cake on Christmas day. Recipe courtesy of What's Cooking Italian Style Cuisine. I swear I've roasted about 5000 nuts this month…ok maybe that’s a bit of an exaggeration…but we have roasted a lot. I got a great nut recipe from a friend (see below) and quickly became addicted. As did most of our guests. 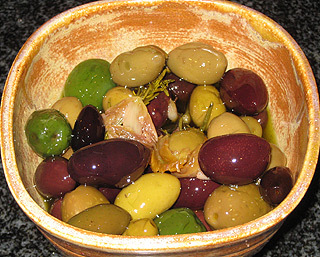 Warmed spiced olives also become somewhat of a regular on our table this holiday session. We made a porcini and spinach stuffed standing rib roast on Christmas day with some really delicious veggies on the side. Crepes filled with Parmesan, used to flavor soup, were also part of our meal. And don't forget the Nutella cake I mentioned above. The star though, this holiday season, was the Timpano we made on Christmas Eve. Have you seen the movie Big Night? If so you’ve seen a Timpano. Basically, it’s a bowl…lined with dough…filled with 2lbs of pasta (1lb in a meat sauce and 1 lb in a béchamel sauce), Prosciutto cubes, grated Parmesan cheese, and about 15 meatballs, capped off with more of the dough. Baked in the oven and served inverted on a plate. That's a Timpano and it’s every bit as delicious as it sounds. I wish I would've got a picture of it got but it went so fast I just didn't have time. 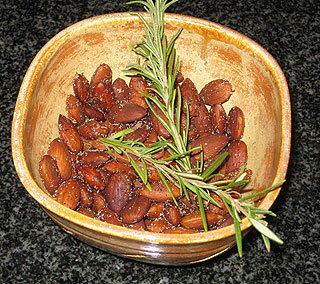 Toss the nuts in a large bowl to combine and spread them out on a cookie sheet. Toast in the oven until they become light golden brown, about 10 minutes. In the large bowl, combine the rosemary, cayenne, brown sugar, salt, and melted butter. Thoroughly toss the warm toasted nut with the spiced butter and serve warm. Whoa, no wonder your house is filled with guests, I would never leave! All beautiful food, I just love Timpano, it's such a statement! Wow, you've been working overtime on all that food. The piece de resistance is that timpano. One of these days I may have the courage to try one. I've always wanted to make a timpano - yours is a thing of beauty! Everything looks incredibly delicious - enjoy your guests! Wow that is incredible. I haven't ever had Timpano before but it looks delicious! Wow...you are super busy...but I know everyone must feel so blessed to sample some of your amazing food. I adore roasted nuts, and I'm eager to try your variety. Thank you for sharing this recipe with me. I wish you and yours a blessed weekend and new year! thanks for sharing, looks fantastic! Oh my gosh this all sounds wonderful! I need a timpano in my life. How have i never heard of it before! Happy New Year!! Next year can I come for the holidays? Everything (especially the timpano) sounds fabulous! Happy New Year to you and your family ! May year 2011 bring lots of wonderful thing in life. Wow! Come e bello il timpano! We make a bomba di riso that always reminds me of timpano, but I suppose they are actually quite different. It looks delicious, as do all of your recipes!